(1) Where the Earth and Sky are Sewn Together: Sobaípuri-O’odham Contexts of Contact and Colonialism. (3) A Fateful Day in 1698: Archaeological Insights into the Remarkable Sobaipuri-O'odham Victory over the Apache and their Allies. She received her doctorate and master’s degrees in Anthropology from the University of Arizona in 1990 and her Bachelor's degrees with honors in both Anthropology and Environmental Studies from the University of California, Santa Cruz in 1980. She has taught, was employed by a number of state and federal agencies, and has worked for a number of cultural resource management firms, including one she founded and directed. 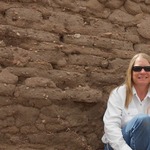 Now she is a full-time research archaeologist affiliated with two academic institutions and the nonprofit research group Jornada Research Institute and she serves on the boards of two non-profit organizations. Do dietary supplements extend lifespan and prevent brain disease? Good luck Chris. I know the results will be informative. Yes, it is. This is your doing! I know. Itsn't it wonderful! Waiting for chronmetric results is like being 8 and waiting for Christmas morning. Thanks Pat and thansk for being a part of this project. Thank you! I am so pleased. Thank you. I am glad you suggested I try again. And yes, all fund will go to Jornada so that they are tax deductable. Thanks to you and all the other generous donors. Thanks Ron for bringing this up over the top and making this project successful! No one has dated those walls but I am in the process of asking the NPS is we can. That will be interesting and yes, they are sun dried bricks like the others, which means we can date them with OSL not TL. You're welcome and thank you so much for your support. We are almost there!